This lengthy article was inspired by my discovery of several very intriguing steins which at first I could not explain. Over the course of my studies I discovered that they were related to a poem entitled "The Glutton's (or Fool's) Paradise" written in the 16th century by Hans Sachs, Meistersinger of Nuremberg. Like many studies, the more I knew, the more I was puzzled, and my continued examination of the themes and decorations on these steins led me to a German association called the Schlaraffia society. In this article I discuss Hans Sachs and the Meistersingers of his time and then look at the poem which establishes a context for the steins which began this search. From there we examine the steins themselves, then explain the nature of the Schlaraffia society, examine two Schlaraffia chapter steins which I found later, and consider some of the German drinking habits or traditions which appear on our steins. Hans Sachs, 1494-1576, German poet, leading Meistersinger of the Nuremberg school. A shoemaker and guild master, he wrote more than 4,000 master songs in addition to some 2,000 fables, tales in verse (Schwanke), morality plays, and farces. His Shrovetide plays, humorous and dramatically effective, present an informative picture of life in 16th-century Nuremberg. The Meistersingers had their origin in the early part of the fourteenth century, and their golden age was about the time of the Lutheran Reformation. A versifying mania had taken possession of the lower classes. As one historian phrases it, blacksmiths, weavers, shoemakers, doctors, and schoolmasters sought to mend their fortunes by making verses. Companies of these persons formed themselves into guilds or corporations, calling themselves "Mastersingers," and holding periodical gatherings at which they criticized each other�s productions. They composed their verses in conformity with certain strict guild rules; accuracy, industry, and painstaking care, rather than an unfettered expression of the true spirit of poetry, were the main features of the Mastersingers� art. "Every fault was marked, and he who had the fewest faults was awarded the prize and permitted to take apprentices." When his apprenticeship was over the young man was admitted to the corporation as a full-fledged Meistersinger. "purged of some vulgarities which the modern reader will prefer unprinted." The Sluggards sit in full command. Through hills of porridge, to his goal. Are strung for fences in the town. The dogwood - Doughnuts. It's God's truth! You reach and catch them with your hand. Just gape - they'll fly into your mouth! And stand by while you carve your slice! The very horses drop - poached Eggs! Cherries hang down to each man's knee. Where he who misses gets the loot. And being first is a disgrace. The lender pays you back I hear. Provokes the populace to spit. Is promptly shooed across the border. Is promptly dubbed a gallant Knight. Are you like that? Alack-a-day! Go to Schlaraffenland and stay! Now go and do the opposite! For laziness will never pay. The stein seen directly below is an etched, ivory stoneware piece that is marked HR #407. It was manufactured for Hauber & Reuther by Merkelbach & Wick. The next stein (below) is salt glazed stoneware, or steinzeug, done in relief, with transfer and enamel d�cor. Actually, we're going to look at two examples of the same stein. The stein shown above features a painted scene on a body which is decorated in relief above and below the scene. A second version of this stein is shown below, this time with a large owl dominating the lid. Both of these steins (above and below) are marked LB&C, have no model number and they were manufactured by Hauber & Reuther, as evidenced by the miniscule "gesetzlich gesch�tzt" on the base and the HR capacity mark. Both steins employ a lizard, or salamander, as the handle, and the stein below features a large (and original) figural inlay of an owl. To the best of my knowledge Hauber & Reuther was the only manufacturer to produce, or have produced for them, steins with the Schlaraffenland theme. The bases of all three of these steins are similar, but of course, the first is etched and the others are in relief. 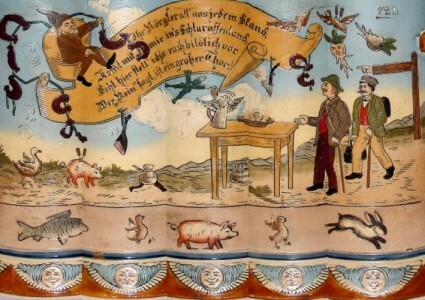 Neither the salamander nor the owl have anything to do with the poem, so their presence on the stein, was somewhat of a mystery until I learned about the Schlaraffia Society. After a bit of research into the meaning of the steins discussed earlier, the mysteries began to fade, revealing a couple of interesting stories. The owl, or UHU, has been recognized since ancient times as a symbol of wisdom, but it is virtually unknown as the emblem of the Schlaraffia Society. The owl in this case, is the European Eagle Owl (Bubo bubo), seen at right. The Schlaraffia Society was founded in Prague, on October 10, 1859, by opera singer Albert Eilers after he was snubbed for membership in Arcadia, an upper crust association of art aficionados. The goals of Schlaraffia are to foster an interest in music and the arts, provide some humor and promote friendship among its members. Songs, poems, or skits, written by members, making fun of the politically and socially pretentious, may often provide the humor. The selection of the eagle owl as their emblem was somewhat serendipitous. The Gasthaus, or hotel, where they held their first meeting had a stuffed eagle owl mounted over the inside entrance and those in attendance decided that it represented their interests and goals better than anything else. At one time there were 144 Schlaraffia chapters in Germany alone. In 1935 Hitler ordered the society to expel all of its Jewish members. The society pretended to comply by removing those member's names from their membership lists. However, even though their names had been removed from the lists, all were encouraged to keep attending the meetings. Finally, in 1937 Hitler closed down the chapters for not complying with his orders, trashed their meeting halls, stripped the books from their library shelves and burned them. After World War II it was still necessary for those members in Eastern Europe to meet secretly because the Society was banned by the Communists. Today they can once again meet openly in Prague where the society was founded. Shown below are a couple of modern Schlaraffia pins. The pin to the left is from Schlaraffia Vindobona. Vindobona is the ancient Roman name for what is now Vienna, Austria where this Reych, or chapter, is located. Currently, the Schlaraffia Society has over 400 chapters worldwide, with some 12,500 members, about 1,000 of which reside in the United States. New Jersey alone has three chapters. The society has only two membership requirements, you must be male and you must speak German, or at least be willing to learn German. Their weekly meetings are held in halls called Burgs (see above), where they dress in medieval costumes, address each other with humorous titles and German is the only language allowed. Religion, business and politics of a personal nature, are forbidden subjects within the Burg. All members are considered equals regardless of their occupation, or station in life. The LB&C stein discussed earlier could very well have been produced for sale to society members. The scene on the body of that steins shows two individuals dressed in medieval clothing with their street attire hanging on the bushes behind them; a glove, a top hat, a pair of long trousers and what appears to be a tie or cravat on one and a student jacket and a pipe on the other. This would seem to indicate that the characters are in costume only and not actually living in the middle ages. only then is it time for the Eagle Owl to go home. Die Activen i/l (ihrer lieben) Oberuhu "Zollkare" zum 26.10.03. (From) the Members (to) i/l (their dear) Chief Eagle Owl "Zollkare" on October 26, 1903. The use of "zum" before the date tells us the date is an anniversary of some kind. There are two exclamations, one on either side, Aha! and Uhu! Aha! is the positive exclamation of "I told you so! Eureka! and Yes!" all rolled into one word and of course Uhu! is simply, but maybe a bit more than simply in this case, the German word for Eagle Owl. The lid is engraved with a monogram of the owner's initials and the names of 16 chapter members. This 1.0 liter steingut stein is marked E.D.& C. and was manufactured by Ernst Dorfner. Schlaraffia Monachia i/l Damian zum 50 Geburtstag (From) Schlaraffia Monachia (to) i/l (their dear) Damian on his 50th birthday." All in all, a very nice stein. Another view of the massive silver finial and the Wappen of Schlaraffia Monachia are seen below. "The wretch who has lost his beer honor is indeed a pitiful case. Being declared under the ban by the president, he is forthwith "chalked down" (by a beer-honorable fox, as already described) with the opprobrious title, Bierschisser, on the blackboard, the pillory of weak-kneed drinkers. From this ignominious position he can only extricate himself by "fighting out" after the manner to be hereafter explained. Meanwhile he can take no part in the musical diversions of the evening; he must not participate in the mysterious rite known as "rubbing a salamander"; he cannot act as beer judge, umpire, or witness in a beer trial; he can not challenge anyone to drink, or "drink in response" to anyone who may challenge him; and generally he is in a very bad way." In the following, the terms used are a mix of German and Latin. The translations are how we might expect to hear them in modern English. The word "salamander," in this case, is derived from the term "Sauft alle mit einander" (All drink together). However, the word Sauft means more than just drink; it is one of those over the top words meaning "get sloshed" or "guzzle." To have a Rubbing of the Salamander ("einem einen Salamander reiben") proposed to you is evidently considered a great honor. As the leader, or toast giver, proposes to honor a guest or special person, all stand and lift their steins at the words of the leader, "Ad exercitium salamandris praeparatiestisne?" (Are you prepared to do the salamander?) The drinkers say in unison, "Sumus" (we are). The leader further orders, "Salamandes inciptur, eins, zwei, drei," (Begin the salamander, one, two, three) and each drinker rubs his stein on the table three times. The leader further instructs them with, "Bibte eins, zwei, drei" (Drink up, one, two, three) and all steins are emptied in unison to the count one, two, three. They are then rattled on the table till the leader once again says, "Eins, zwei..." (one, two...) and all steins are held still until the leader says,"Drei!" (three) whereupon all bang their steins on the table. A variation of this is the "Trauersalamander." All done as before, except the glasses are "rubbed" in the air and they are stopped before striking the table. A silent, solemn ceremony honoring a departed brother. I believe the student blazer and pipe on the bush behind the individual at the left of the scene on the LB&C stein is the connection to the handle that identifies it as a salamander. Even if you don't agree with this assumption, you will at least know how to "rub a salamander" in case you are ever called upon to do so. "The beer code, or Bier-Comment of the Senior University, Heidelberg, as it is officially known, has passed through several revisions and editions since 1829. In common with other university beer codes, however, the Heidelberg laws begin with paragraph 11. Paragraphs 1 to 10 are left blank, being presumably the ten commandments of the Old Testament. The eleventh paragraph, or commandment of Heidelberg University reads: Es wird fortgesoffen, or, freely translated, "Keep on drinking." On the lid, which I feel is at least as appropriate, if not more so than the original, we see a robust gentleman with his bowl of dumplings, and on the table in front of him, more dumplings, a roast chicken, a loaf of bread, his 1.0 liter beer stein and a jug, on the floor beside him, for refills. All in all, a great lid and thumblift for a stein representing the Glutton's Paradise. However, over the man's head is a sign, seen below, that reads "Schweningerkur" and this was also a mystery. I inquired on the SCI web site to see if anyone was familiar with the word and I received one reply that, while it was a good guess, unfortunately turned out to be incorrect. That same day, I received an e-mail from Walt Vogdes to let me know that he had tried the Internet, and got a couple of hits on the word, but hadn't attempted to determine the word's meaning. So, I tried the Internet myself and got three hits. The first hit was for a book appropriately titled "Die Schweningerkur" and the other two were extracts from German publications that contained the word. The book had been written by one Oskar Mass and published in Berlin by Steinitz & Fischer in 1886. The second hit concerned a group of friends, one of whom was a former drunk and was now on the wagon after taking the Schweningerkur. The third was about a person who was traveling in the Middle East, was over weight, and wished they had had time to take the Schweningerkur before making the trip. Evidently the cure addressed both eating and drinking disorders. Was the Schweningerkur one of those fad cures that were very popular during the latter part of the 19th century, not unlike today's many fad diets? Possibly it was, because about six weeks after my inquiry, I received a second reply. Apparently the Schweningerkur was devised by one Dr. Ernst Schweninger (1850-1924) who in 1882, became the personal physician of Otto von Bismarck. Bismarck had both eating and drinking problems and Dr. Schweninger devised a plan of exercise and proper diet for him that helped him loose weight and keep it off. Bismarck declared that "Without him I would have died." After that, Dr. Schweninger became a "Celebrity Doctor" and in addition to Bismarck he became the personal physician to Alfred Krupp and Cosima Wagner. The "Schweningerkur" sign on this lid, may have been a reminder to the owner not to over indulge, or they might have to take the Schweningerkur. Portions of this article first appeared in Prosit, but before the article appeared in print it began to grow. This version is considerably expanded, and covers additional material and newly acquired steins. Walt Vogdes was instrumental in structuring my work for the SCI web site. My thanks also to Walt Vogdes and Terry Hill for the information on "Rubbing a Salamander" and to Marc Lang and Walt Vogdes for help in decyphering the inscriptions on the Schlaraffia Society steins. Lowenstein, Jack, Beer Drinking Customs at the University of Heidelberg, Baden, an excerpt from One Hundred Years of Brewing, the Western Brewer, H. S. Rich & Co., Chicago/New York, 1903 (pp. 689-690). Oxford English Dictionary, vol. 18, Oxford: Clarendon, 1989. Hinrichs, Hans, The Glutton's Paradise, Being a Pleasant Dissertation on Hans Sachs' Schlaraffenland and Some Similar Utopias, Peter Pauper Press, Mount Vernon/New York, 1955.